When a Chipotle Mexican Grill first opened in my Chelsea neighborhood of Manhattan I was ecstatic. Newly separated and newly arrived from California, I was on, yes, a new path: mentally, emotionally and nutritionally. Sorry, Raza, lo siento, Grandma Cuca, but I loved their white rice with cilantro, tangy corn salsa and that grilled tofu, just like Tia -- well, actually, none of my tias ever made such Mexican style cuisine. At that Chipotle on 8th Avenue, I often sat alone, reading over the Chipotle nutritional guide, The Village Voice, or whatever magazine or newspaper left behind by another customer. After all, it was New York City. You can always find something to read anytime, anywhere. But that was years ago. While I still have my Chelsea co-op, I now live full-time in Berkeley, California, where I married a man (Mexican American, for what it's worth) who owns the very popular vegan Mexican restaurant, Flacos. Since our union in 2010, I have had an all access pass to delicious organic, healthy, comida mexicana. Yes, I married well. But, I gotta admit, from time to time, that old East Coast lover sometimes tugged at my heart and hunger strings. I still had a thing for comida Chipotle and I felt guilty. One afternoon, while my husband was at work, I snuck over to the nearest Chipotle in Berkeley. I ordered one of their gourmet burritos and shamefully ate the whole thing in my car, in the parking lot, the whole time looking over my shoulder for fear someone might see me. The wife of the owner of one of the most popular Mexican restaurants in the East Bay eating at another "Mexican" restaurant? I don't think so. As soon as I finished eating, I made sure to quickly dispose of all the wrappers, napkins -- any and all evidence of my secret Chipotle tryst. But that wasn't the only time I cheated on my husband. Many times, when I've made the six-hour drive from Northern California to my childhood home in Southern California, I've paced my driving speed so I could take a rest and lunch break half-way through my trip at (surprise!) a Chipotle in Central California. Yes, I would do just about anything for a little something something from Chipotle. 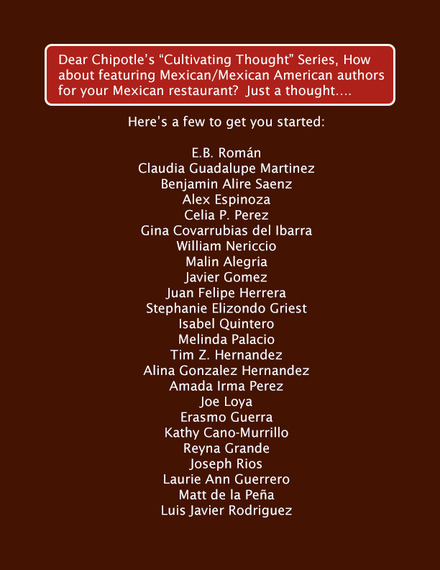 A few days ago, fellow author (Still Water Saints, The Five Acts of Diego Leon) and Associate Professor at Fresno State University, Alex Espinoza, created "Cultivating Invisibility: Chipotle's Missing Mexicans" on Facebook. Que, que? So, I read up on Alex's page. And then I saw the video. In the "Cultivating Thought" marketing video, Jonathan Safran Foer (JSF) laments about eating a Mexican meal in a Chipotle Mexican Grill with nothing to read. He shared this conundrum to Chipotle's Founder and Co-CEO, Steve Ells, who loved JSF's idea of putting stories on Chipotle's cups and take-out bags. This, as JSF states, offers patrons a chance to "feel engaged" while eating Chipotle's Mexican food. Ten authors were chosen. Many, artists whom I adore, but none of them, however, were Latino -- let alone Mexican or Mexican American. Doesn't Chipotle Mexican Grill serve, um, Mexican food? 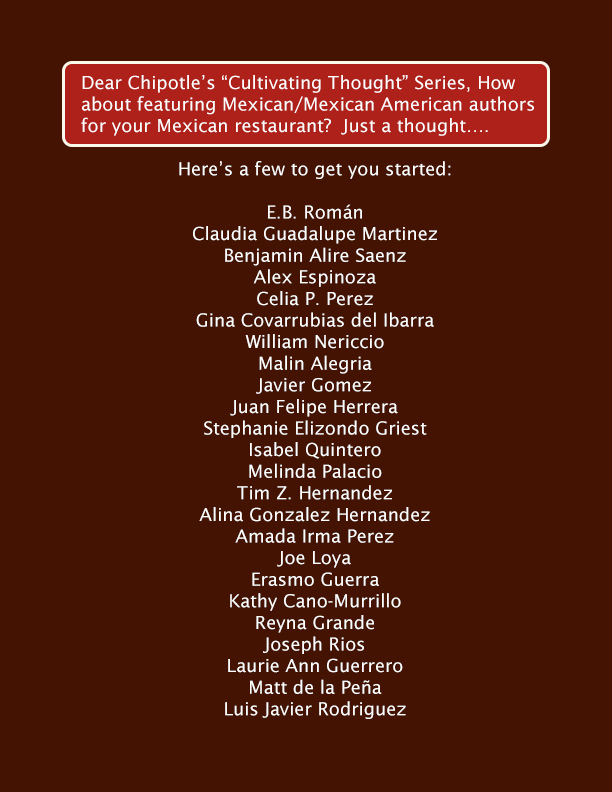 Wouldn't having Mexican or Mexican American authors fit their burritos and bards theme? Such an oversight, to put it lightly, would most definitely not fly at a soul food restaurant chain if not one African American author had been chosen to participate. And, yes, I had to go and use that race card; that familiar card I've had to lean on many times so people can understand how our brown community still experiences The Three D's: disenfranchisement , dismissal, and disrespect (Mexicans LOVE to use that last word). It was then I took a cue from JSF and decided to come up with my own list of writers that Chipotle could have used for their series. I included some well-known authors, some up-and-coming writers, and some authors whose work I feel demands major attention. My list was sent to both Chipotle Mexican Grill's Facebook Page and Jonathan Safran Foer. I heard back from Chipotle's service consultants (thoughtful), but not JSF (not so thoughtful). Writer Liz Gonzalez also posted her concerns on Chipotle Mexican Grill's Facebook page. We each received encouraging, albeit inconsistent, replies from Chipotle's customer service consultants. "Rusty" told me that "the project is just getting started and will take [the idea of including Mexican/Mexican American authors into consideration] for the next round" while "Kate" enthusiastically responded to Liz, "...it would be pretty awesome to have some Mexican-American or Latino authors included... should we continue this campaign." JSF says in the "Cultivating Thought" marketing video, "It's better to learn something than not learn something." He also states that the series will give "800,000 people access to good writing." Here's something to learn: According to CNN's Global Public Square in 2013, 11 million native-born Mexican American and another 6 million (listed as undocumented) live in the U.S. Let's give those 17 million access to OUR good writing. Now that would be pretty awesome.